Certain herpes viruses cause roseola. These are different than those that cause cold sores . Your child gets it from the saliva of people who carry the infection. This can happen through kissing or other close contact. Roseola. Nemour Kids Health website. Available at: http://kidshealth.org/en/parents/roseola.html. Updated January 2015. Accessed May 21, 2018. 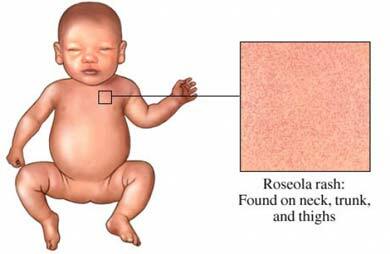 Roseola infantum. EBSCO DynaMed Plus website. Available at: https://www.dynamed.com/topics/dmp~AN~T115041/Roseola-infantum . Updated August 20, 2015. Accessed May 21, 2018.